1. What is the Currency of Australia ? 2. What is the Currency of Palau ? Ans : United States Dollar. 3. What is the Currency of Fiji ? 4. What is the Currency of New Zealand ? Ans : New Zealand Dollar. 5. What is the Currency of Samoa ? 6. What is the Currency of Papua New Guinea ? 7. What is the Currency of Vanuatu ? 8. What is the Currency of Solomon Islands ? Ans : Solomon Islands Dollar. 9. What is the Currency of Nauru ? 10. What is the Currency of Kiribati ? Ans : Australian Dollar, Kiribati Dollar. 11. What is the Currency of Micronesia ? 12. What is the Currency of Marshall Islands ? 1. What is the Currency of Argentina ? 2. What is the Currency of Brazil ? 3. What is the Currency of Bolivia ? 4. What is the Currency of Chile ? 5. What is the Currency of Colombia ? 6. What is the Currency of Ecuador ? 7. What is the Currency of Guyana ? 8. What is the Currency of Paraguay ? 9. What is the Currency of Peru ? 10. What is the Currency of Suriname ? 11. What is the Currency of Uruguay ? 12. What is the Currency of Venezuela ? 1. 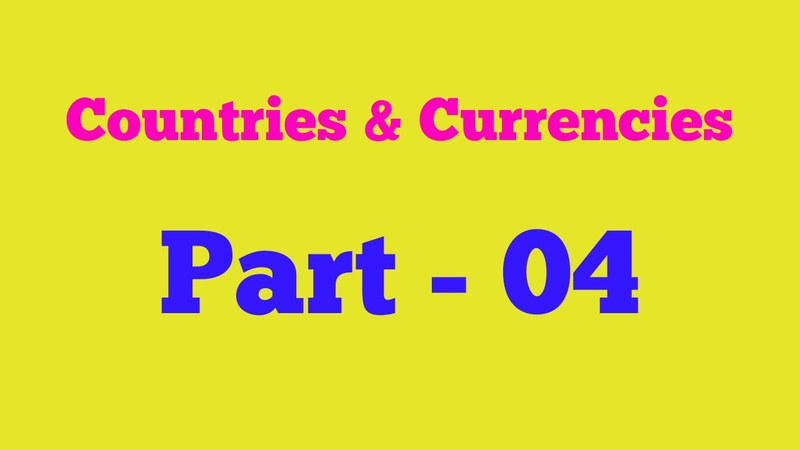 What is the Currency of Antigua & Barbuda ? Ans : East Caribbean Dollar. 2. What is the Currency of Bahamas ? 3. What is the Currency of Barbados ? 4. What is the Currency of Belize ? 5. What is the Currency of Canada ? 6. What is the Currency of Costa Rica ? Ans : Costa Rican Colon. 7. What is the Currency of Cuba ? 8. What is the Currency of Dominican Republic ? 9. What is the Currency of Dominica ? 10. What is the Currency of El Salvador ? 11. What is the Currency of Grenada ? 12. What is the Currency of Guatemala ? 13. What is the Currency of Greenland ? 14. What is the Currency of Honduras ? 14. What is the Currency of Haiti ? 15. What is the Currency of Jamaica ? 15. What is the Currency of Mexico ? 16. What is the Currency of Nicaragua ? 17. What is the Currency of Panama ? 18. What is the Currency of Saint Luca ? 19. What is the Currency of Saint Kitts & Nevis ? 20. What is the Currency of Trinidad and Tobago ? Ans : Trinidad & Tobago Dollar. 21. What is the Currency of United States of America ? 1. What is the Currency of Andorra ? 2. What is the Currency of Austria ? 3. What is the Currency of Albania ? 4. What is the Currency of Belgium ? 5. What is the Currency of Bulgaria ? 6. What is the Currency of Belarus ? 7. What is the Currency of Bosnia ? 8. What is the Currency of Croatia ? 9. What is the Currency of Czech Republic ? 10. What is the Currency of Denmark ? 11. What is the Currency of Estonia ? 12. What is the Currency of France ? 13. What is the Currency of Greece ? 14. What is the Currency of Germany ? 15. What is the Currency of Hungary ? 16. What is the Currency of Italy ? 17. What is the Currency of Iceland ? 18. What is the Currency of Ireland ? 19. What is the Currency of Kosovo ? 20. What is the Currency of Latvia ? 21. What is the Currency of Luxembourg ? 22. What is the Currency of Liechtenstein ? 23. What is the Currency of Lithuania ? 24. What is the Currency of Malta ? 25. What is the Currency of Monaco ? 26. What is the Currency of Macedonia ? 27. What is the Currency of Moldova ? 28. What is the Currency of Montenegro ? 29. What is the Currency of Netherlands ? Ans : Euro, U.S Dollar. 30. What is the Currency of Norway ? 31. What is the Currency of Poland ? 32. What is the Currency of Portugal ? 33. What is the Currency of Romania ? 34. What is the Currency of Serbia ? 35. What is the Currency of San Marino ? 36. What is the Currency of Switzerland ? 37. What is the Currency of Sweden ? 38. What is the Currency of Slovakia ? 39. What is the Currency of Slovenia ? 40. What is the Currency of Spain ? 41. What is the Currency of Turkey ? 42. What is the Currency of Ukraine ? 43. What is the Currency of United Kingdom ? 44. What is the Currency of Vatican City ? 1. What is the Currency of Algeria ? 2. What is the Currency of Angola ? 3. What is the Currency of Benin ? 4. What is the Currency of Burkina Faso ? 5. What is the Currency of Burundi ? 6. What is the Currency of Botswana ? 7. What is the Currency of Cameroon ? 8. What is the Currency of Chad ? 9. What is the Currency of Congo ? 10. What is the Currency of Central African Republic ? 11. What is the Currency of Comoros ? 12. What is the Currency of Cape Verde ? Ans : Cape Verde Escudo. 13. What is the Currency of Djibouti ? 14. What is the Currency of Egypt ? 15. What is the Currency of Eritrea ? 16. What is the Currency of Equatorial Guinea ? 17. What is the Currency of Ghana ? 18. What is the Currency of Gabon ? 19. What is the Currency of Guinea ? 20. What is the Currency of Guinea Bissau ? 21. What is the Currency of Ivory Cost ? 22. What is the Currency of Kenya ? 23. What is the Currency of Libya ? 24. What is the Currency of Liberia ? 25. What is the Currency of Lesotho ? 26. What is the Currency of Mali ? 27. What is the Currency of Madagascar ? 28. What is the Currency of Mozambique ? 29. What is the Currency of Morocco ? 30. What is the Currency of Malawi ? 31. 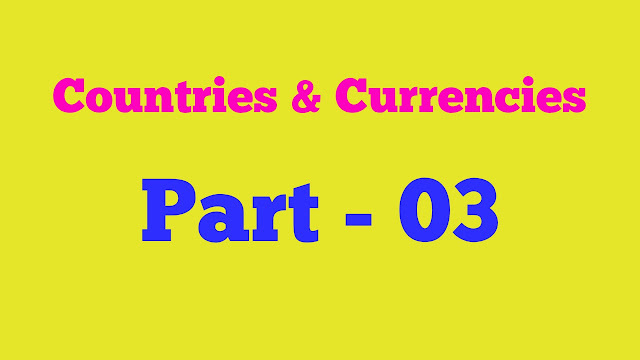 What is the Currency of Mauritius ? 32. What is the Currency of Mauritania ? 33. What is the Currency of Namibia ? 34. What is the Currency of Nigeria ? 35. What is the Currency of Niger ? 36. What is the Currency of Rwanda ? 37. What is the Currency of Senegal ? 38. What is the Currency of Swaziland ? 39. What is the Currency of Sudan ? 40. What is the Currency of Seychelles ? 41. What is the Currency of Sierra Leone ? 42. What is the Currency of Somalia ? 43. What is the Currency of South Africa ? 44. What is the Currency of Tanzania ? 45. What is the Currency of The Gambia ? 46. What is the Currency of Togo ? 47. What is the Currency of Tunisia ? 48. What is the Currency of Uganda ? 49. What is the Currency of Zimbabwe ? 50. What is the Currency of Zambia ?